This post has been written by Mary, 6, who is at primary school and attended our ‘Stemettes Hack Cambridge @ Microsoft Research‘ event on 17 & 18 March 2018. 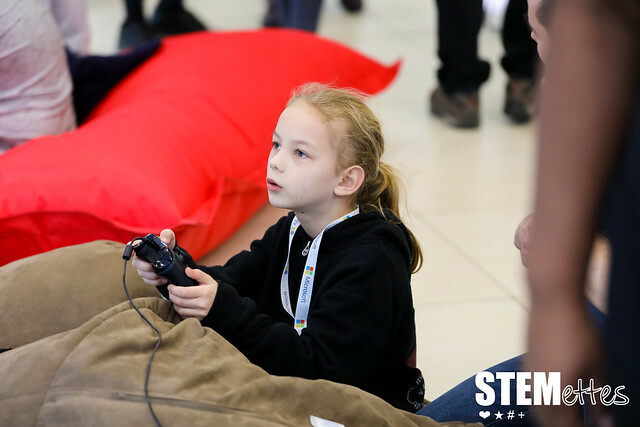 My name is Mary, I am 6 years old, it was my first time at Stemettes, and my first time doing Minecraft. It was a bit difficult but I quickly grasped it because it was similar to Scratch. On my first day I learnt all of the functions and we coded our Agent to make it rain chickens. Then we started connecting coding blocks to make it rain chickens, I did it but it was hard. We followed some other tutorials like Lava Tower, and then we got to make a 3D monster on paint and we took selfies of the monster sitting on our shoulders. Mary (middle) and Bola (right) working on her Minecraft project. On Sunday we followed a tutorial called The Agent Build, I found agent build a bit challenging because I had to go over and over again because I couldn’t get the agent to do what I wanted it to do. Making the mazes was hard, I found it tricky because I didn’t know a lot of Minecraft, but I did get it a bit. We then had presentations and I did one, I found it very scary but I was very happy when I did it. I also made a friend her name is Harper; Harper and her dad was very nice to us, and I also got to eat some sweets. My brother also tried to do Minecraft but he couldn’t do much, he knows a bit of Scratch but all he really did was smash the blocks as he’s only 4. All the helpers were very nice, Lucy helped me lots on Saturday and then Bola helped me on Sunday and sometimes Lucy when my laptop was giving trouble, I got to use Anne-Marie’s Laptop, I felt really special using her laptop. We had 54 girls and young women coding with us over the weekend. They gave it all 8.26 out of 10! 88% expressed improved STEM confidence. 82% had an improved perception of STEM. 91% had increased awareness of STEM options and 85% had an increased STEM network. 79% improved ability to carry out project work, 94 want to do coding in the future (17% hadn’t done any before, 22% had already done lots). 94% would like to come to a Stemettes event again. Thanks to Microsoft Research and their foundation for partnering with us on this event, and to the US Embassy for sending Mahvash Siddiqui to join our judging panel. ← Stemettes School trip – to ASOS!